We use a purpose built single-molecule force spectroscope (SMFS) developed by the Fernandez lab at Columbia University and built by Luigs Neumann. This device allows for high throughput analysis of single molecules, elucidating characteristics such as the rate of unfolding and the strength of the bonds holding its conformation. This device can be used with a range of protocols depending on the property of the molecule to be determined: force-extension, force-clamp, force-ramp, and various refolding protocols. One of the main difficulties with high-throughput SMFS is that a great proportion of the data produced is not relevant for study as it does not the display the molecule under investigation. Non-specific binding of the cantilever tip at various points along the molecule leads to incomplete traces. One method to overcome this is to add specific immunoglobulin (Ig) domains at either end of the molecule being studied; these Ig domains unfold with very specific patterns which, if present in a trace, indicate the molecule has been correctly stretched. Thus thousands of force-extension curves can be sorted rapidly by requiring them to have the characteristic ‘saw-tooth’ pattern that indicative of the unfolding of an Ig domain. 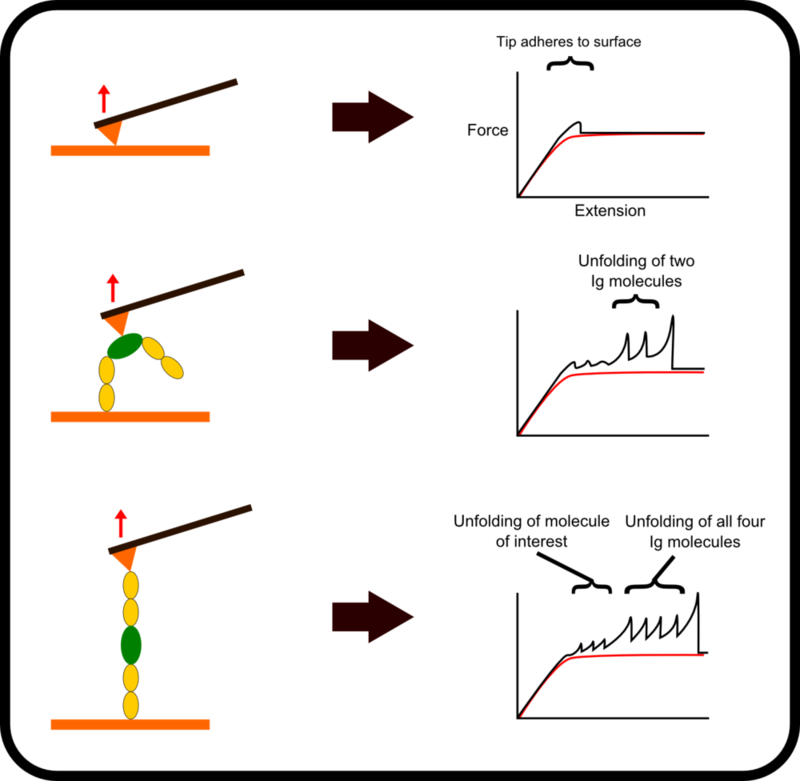 In addition to using flanking molecules to improve the detection of correct stretching traces, surface chemistry can be used to covalently bind the end of the protein construct to surface or the tip. This increases the likelihood that a molecule will be stretched along its full length and thus increases the efficiency of the experiment. The most common way to do this is to prepare the surface such that it contains a particular ligand for an enzyme. This enzyme is then attached at the end of the protein construct, similarly to the fingerprint Ig domains. As such when the protein is deposited on the surface, the enzyme reacts with the functionalized surface to produce a strong covalent attachment between the surface and the protein construct.